So far in this series you developed controls by emitting raw HTML markup. As you will agree with me this can be tedious at times. Won't it be nice if you can assemble existing controls of ASP.NET and render them as a part of your control? In fact this is a common requirement in many cases and ASP.NET provides an easy way out. 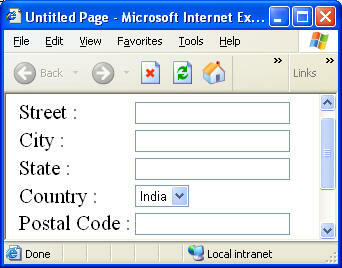 In this part you will develop a custom control that assembles existing server controls such as Label and TextBox. Implement INamingContainer interface. This interface ensures that all the child controls of your control get a unique ID. This way your custom control can keep track of its constituent controls. Call EnsureChildControl() method of Control class to ensure that the child controls are fully loaded before accessing their properties. One can of course code the above steps manually. However, if you inherit from CompositeControl class instead of Control or WebControl class then these steps are automatically done for you. Once you create a class that inherits from CompositeControl class then you need to override the CreateChildControls() method of the Control base class (CompositeControl class inherits from WebControl class that in turn inherits from Control class). Inside the CreateChildControls() method you will instantiate the child controls and add them to the Controls collection. To begin your development, create a new web site using Visual Studio. Add App_Code folder to your web site with one class named AddressControl. Remember to place the custom control class inside a namespace. Now add the following public properties that simply set and get the values for Address control. The AddControlsToTable() method accepts two parameters - a Label that is acting as a field caption and a control to be added. Inside it simply creates a TableRow and TableCell objects and adds the supplied Label and Control to them. The TableRow is finally added to the container table. In the CreateChildControls() method you initialize various controls and set their properties. You then call AddControlsToTable() helper method to add the appropriate controls to the table. That's it. You can now use the Address control on a test web form to see it in action.